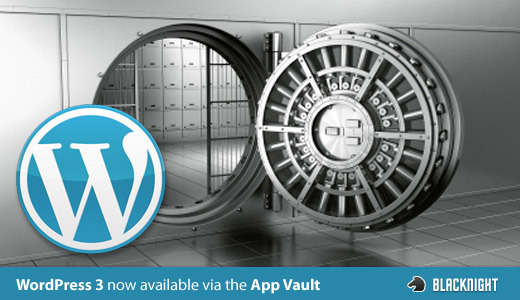 We’re happy to announce that WordPress 3 is now available via the app vault on the Blacknight control panel. The app vault comes with all Shared Hosting Plans which are available from as little as €4.95 a month. So what does all this mean for you ? If you don’t have a blog? and want one with minimum hastle to install then log into your control panel. On the left you’ll see the Application Vault. Click this and then click on blogging software and then click on WordPress and away you go configure it how you will. As always when upgrading WordPress you should check compatibility with your plugins. Plugins are generally created by third parties and may end up breaking things with your install. We recommend therefore during the upgrade process that you disable your plugins before you go to upgrade. As a webdesigner its one of the most common problems I come across with WordPress upgrades, everything stops working. Taking steps to disable the plugins pre upgrade should ensure a safe upgrade. If you’re coming from the land of the self install and your install is relatively up to date you can probably update it via the admin area of WordPress. Again we recommend backing up your files and database (which you can do via the control panel backups and in case anything goes wrong you can revert) checking compatability of plugins and disabling them before upgrading and then re-enabling your plugings. A final word: Most of the current or older themes won’t be able to take advantage of some of the newer features initially however you should be able to see the features via the new twenty ten default theme. WordPress 3 is a really massive improvement. Matt Mullenweg went a bit overboard by including this feature in my opinion. He really hates it when WordPress is misspelled, but by forcing the capital P on us he is “taking the P”. In your case, Darren, installing in a /wordpress directory will not cause a problem – only the content, title and comments are affected. I can’t believe that after being around for so long there were still over 1000 bug fixes to be done! I’m not a particularly big user of WP, but do use it for news pages etc and can’t remember actually finding one. Having to change the site configurations to run php5 as a cgi-module, and getting yourselves to change the ownership of all files and folders on a webspace, seems like a lot of hassle for a simple task.